We have been honored to work with some of the finest families in the Las Vegas Valley. Their appreciation of the quality craftsmanship, creativity and commitment we lavish on their homes is evident in the referrals given to family, friends and business associates. If you would like to hear from our clients about their experiences, please let us know. We are happy to arrange that for you. Merlin Custom Home Builders was the perfect home builder to transition our vision into reality…professional, skillful, flexible and honest. Our Park Towers’ home is as close to perfection as one can get. Your work and the outcome – these many years later – far exceeded expectations. Building our home was an absolute please with Merlin Custom Home Builders. We are still thrilled and delighted 12 years later with the quality of work and the care and thought that went into the construction of our home thanks to Steve and Bart Jones and the Merlin Custom Home Builders team. We are about to start on a remodeling project and will, of course, using Merlin Custom Home Builders. We wouldn’t consider using anyone else! It has been a thrill for us to work with you guys. Our dream home has exceeded our expectations. All our experiences with Merlin Custom Home Builders have been outstanding. Before, during and even after extensive construction and enhancement work, Mr. Jones and his craftsmen have performed and completed all work with excellence and skill. Subsequent work required was not questioned, and completed without extra cost or dispute. Honorable people make a difference and they have earned our trust. We understand that your Merlin Custom Home Builders has a great reputation among all we have inquired, but have shown personally already that you all want to build a house of which to be proud. Fran and I want to thank you and your organization for another fine job. Often times your work helps to beatify some ones world. Sometimes your work actually changes people’s life for the better, as in this case. It is the way that Merlin Custom Home Builders puts it all together that sets them apart! Merlin Custom Home Builders built my home over twenty years ago and it has stood the test of time beautifully. They have also built homes for my extended family and close friends. We wouldn’t go anywhere else! The key to their success is that Steve and Bart are 100% honest and trustworthy. They do the project right and follow up for years after to ensure homeowner satisfaction. Truly a remarkable company. I intended that my home be built with the highest quality material installed by experienced craftsman who would create a home exceeding my expectations in beauty, form and function. Merlin Custom Home Builders did just that! Again, Merlin Custom Home Builders did magic! Thanks! SIX STAR RATING . . . Cannot speak highly enough about Merlin Custom Home Builders. Hired them to turn an empty grey shell penthouse unit overlooking the Las Vegas Strip into my dream home and they exceeded my very ambitious and challenging expectations. Their work in my residence has been featured in the New York Times, various custom design articles and just about every major Las Vegas magazine for it’s attention to detail, creativity and customization. Give Merlin Custom Home Builders the highest grades in craftsmanship, cost-efficient problem-solving and “can-do” attitude. Doing it right the first time was my mantra and they fulfilled from start to finish. Aside from their on-the-job performance I was most impressed with their service and integrity. They were always readily available, accommodated my every request and made me feel as if I was their only customer. It’s been three years since the completion of my project and they still are available to me for adjustments and repairs. When an occasional mistake was made or deadline missed they were open and forthright in sharing the situation with me directly. Never had a doubt in their honesty and continue to be comforted knowing they stand by their work and are committed to ensuring my satisfaction. They are great people who do great work. Would trust them with any project I have in the future. Merlin Custom Home Builders, principals Steve and Bart Jones as well as all the staff, are the team to build your dream home or do remodeling. I don’t think you could find anyone else with as much knowledge of building, flexibility in execution (even in difficult locations and conditions) or patience with clients. They will truly make the building experience positive. I was fortunate enough to have my beautiful home built by Steve and Bart Jones. Throughout the entire process, which many people led me to believe was going to be long and arduous, I felt so comfortable with the process and knew that I was in the best of hands. It was joint project where my needs were of primary concerns and quality was mandated at all times. The result was a house that is a showstopper but more importantly, a comfortable home. Thank you Steve and Bart and everyone at Merlin Custom Home Builders. I would do it all again but I don’t plan to. It’s always a pleasure when you work with professionals and get a finish product that comes out far better then expected. I love my new home, and thanks to the team that made it all happen. I have spent the last year working with the Merlin Custom Home Builders Team planning and designing my home. I cannot say enough good things about this company. Steve and Bart Jones are incredibly warm, kind men who lead a wonderful team. Steve helped me stick to my budget and offered great advice on communicating with the architect and interior designer, using his experience to guide everyone in the right direction. Bart is incredibly encouraging and patient, always available with answers to questions about the process and how best to proceed. Every employee has been knowledgeable, professional, pleasant to work with, and very quick with their responses. The team at Merlin Custom Home Builders have hosted meetings with contractors, negotiated on my behalf, paid meticulous attention to detail, and even administered first aid when I injured myself right before a meeting! Merlin Custom Home Builders has made a very involved and complicated project feel fun and exciting. I have every confidence in Steve and Bart Jones and their team. I look forward to breaking ground and seeing my dream home become a reality. It has been a pleasure working with your team and we hope to continue to work together. We value the professionalism and care taken by your team while completing the unit modifications. Please contact me directly if I may ever be of assistance. Merlin Custom Home Builders has been working in One Turnberry Place Condominium on our largest unit for the past year. I cannot express enough how professional they have been during their time here in the building. Their supervisors, and workers have consistently gone out of their way to make certain that they follow the rules and regulations of the building. They have made a point of keeping in close communication with both management and staff, and make certain that while they do an excellent job for the homeowner, they cause no undue burden to any other owner or resident. As a building manager, I would recommend them without hesitation. They have not caused any unnecessary issues for our Association, and have been a pleasure to work with during their time here. I would like to give my highest recommendation on behalf of Steve Jones and the entire Merlin Custom Home Builders Team. Merlin Custom Home Builders has successfully completed several homes at Park Towers over 10 years during my time as General Manager and for the past year at One Queensridge Place. Merlin Custom Home Builders’s staff has always been professional, courteous and adhered to our rules. It is a pleasure to work with them and I have never received any complaints from Homeowners regarding their operations or workmanship. Merlin Custom Home Builders is the best luxury home builder in Las Vegas. Steve & Bart Jones natives to Las Vegas bring over 25 years of experience to the construction industry. They do not just build houses, they make your dreams come true and they craft one of a kind homes. I had the opportunity to work with them a number of times over the years and can attest to their dynamic quality and attention to detail, and they are able to build anything your design team can dream up. If you are looking for the best and want your project to be unique, call Steve Jones. His construction team will make it happen. Highly recommend! I can’t say enough good things about Merlin Custom Home Builders. Their staff is extremely friendly and professional and their dedication to each one of their projects past, present, and future is unmatched. Many builders will separate themselves from a project after the final inspection but Steve and Bart stick with you and provide excellent service if further issues pop up, big or small. Their attention to detail is extraordinary and they have an amazing ability to turn even the craziest ideas into beautiful reality. If you’re thinking of building a custom home and you want it to be perfect then Merlin Custom Home Builders is the company that should build it. No question. I have been a subcontractor in the Las Vegas Area for 20 years. There are few General Contractor’s that have made it through tough times, and the ones that have made have done it for a reason. Merlin Custom Home Builders is a top-notch professional outfit that requires subs to be responsive, on time, quality & service driven. Because of these traits we have been successful in the projects we have worked on for them. From the bidding process to final walk-through, it is always a pleasure to be on their jobsites and with their staff. Always professional & courteous. I cannot remember a “stressful” experience working with them. We at Silver State Specialties, LLC look forward to many more years of building luxurious homes in the Las Vegas area with Merlin Custom Home Builders as the General Contractor. Personally, I would not hesitate to have Merlin Custom Home Builders build MY dream home! Hopefully one day down the road I can make that happen! Silver State Fireplaces, Inc is proud to have worked with Merlin Custom Home Builders on the construction of many very unique projects in the Las Vegas area. Merlin Custom Home Builders is on the cutting edge with new home designs and construction philosophies and we are proud to be their contractor of choice when it comes to designing and installing truly unique Fireplaces for their homes. They are a top shelf contractor that expects the best from their suppliers and subcontractors yet treat them with the respect that the best in the industry deserve from each other. Our relationship has spanned many years and we truly enjoy the partnership that we have. Mueller Turner Company has been fortunate enough to have worked for Merlin Custom Home Builders for many years as one of their custom cabinetry subcontractors. Steve and Bart Jones always represent their intent with integrity and professionalism as do their employees. They demand top notch service and quality from us and they will settle for nothing less. We can depend on them to provide us with good communication flow of accurate information throughout the course of each project from the earliest stage of bidding and construction to completion of our installations. We work with esteemed general contractors from coast to coast and internationally, Merlin Custom Home Builders is worthy by comparison. Merlin Custom Home Builders, our customer for more than 17 years, is a pleasure to work for because they understand that the final quality of a building project begins while the project is still on paper. They work out design and installation requirements, methods, schedules and coordination between subcontractors during the planning stages of the project and employ superintendants that pay attention to details and understand the construction process from beginning to end. The office staff keeps the administrative portion of the projects running smooth. Our company specializes in Custom homes and small commercial and has been licensed in Nevada since 1979. We appreciate the effort that Merlin Custom Home Builders puts into making sure that their projects run efficiently. This effort makes our job easier and the overall effect is superior quality and value for the project owner. Based on the high quality standards placed on their subcontractors and building experience and practices, I highly recommend Merlin Custom Home Builders. ATM Commercial and Construction Cleaning Services is the commercial division of Annie The Maid. ATM has been cleaning for Merlin Custom Home Builders for the past several years. When performing a “Final Construction Clean” on a Merlin Custom Home Builders project we touch every inch of the interior and are always amazed at the perfection that goes into each and every job. The Merlin Custom Home Builders team, from the office to the field are all very professional and pleasant to work for. They follow the rules and expect us to do the same. When it comes to the contractual part of our agreement, they dot all of their i’s and cross all of their t’s. We have never had an issue with getting paid, they always pay on or before the due date. Merlin Custom Home Builders Superintendents are the very best – they keep their job site clean and neat. Their timeline is always exact. They demand perfection. ATM cleans millions of square footage each year and can definitely tell the difference in craftsmanship when cleaning a Merlin Custom Home Builders job. I have subcontracted to Merlin Custom Home Builders Construction for over fifteen years and find their professional approach to every aspect of their projects is a pleasure to deal with. Their reputation is above reproach and I would absolutely hire them for any type or size construction project I was building. 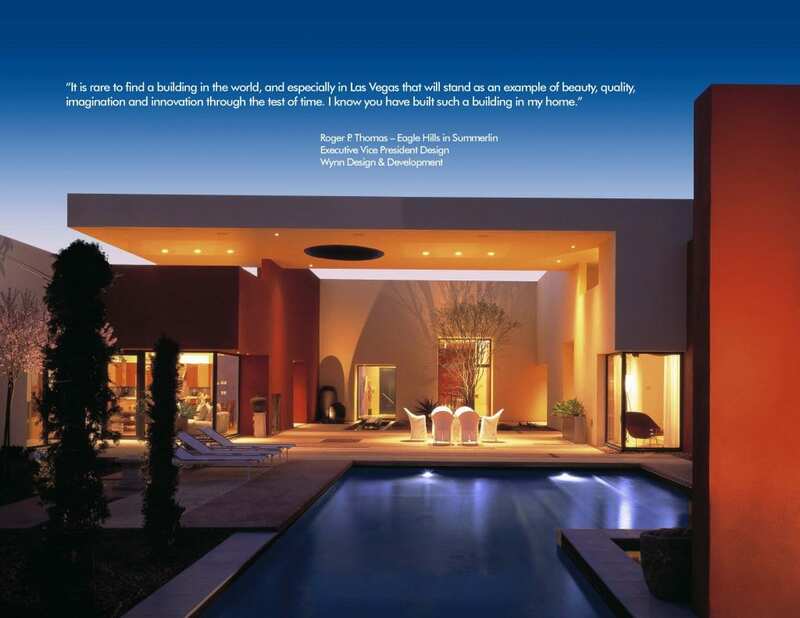 Prestige Roofing, Inc., has worked with many contractors on all types of custom homes in the Las Vegas area. We have worked with Merlin Custom Home Builders on several of the highest profile custom home projects in the area. Merlin Custom Home Builders is one of the absolute top General Contractors to work with. With their professional office staff and field personnel, they always deliver the best product. They demand performance from all of their subcontractors, which makes every job run as smoothly as possible. We feel very honored to be a part of this elite team. Three Square, Southern Nevada’s food bank, is grateful for our partnership with Merlin Custom Home Builders. Bart and Steve lead a team filled with kind and compassionate community leaders who are not only committed to building beautiful spaces, but a vibrant Las Vegas. Since 2013, Merlin Custom Home Builders’s generosity has provided more than 138,000 meals for the children, seniors, and families in Southern Nevada who struggle with hunger – clearly demonstrating our shared vision that “no one in our community should be hungry”. Chairman of the Board, Emulex Corp.
Frank and Vicky Fertitta, Jr.
Former General Counsel for Mirage Resorts, Inc.
Paulson and Co., Inc. / Raintree Investment Corp.
Vice President, Las Vegas Sands Corp.